(CNN)It’s already home to the world’s tallest buildings, biggest shopping malls and largest man-made islands. IMG Worlds of Adventure, an amusement park that cost more than $1 billion dollars and took three years to build, opened its doors to the public on Wednesday. The park is as big as 28 football fields, measuring some 1.5 million square feet in size. 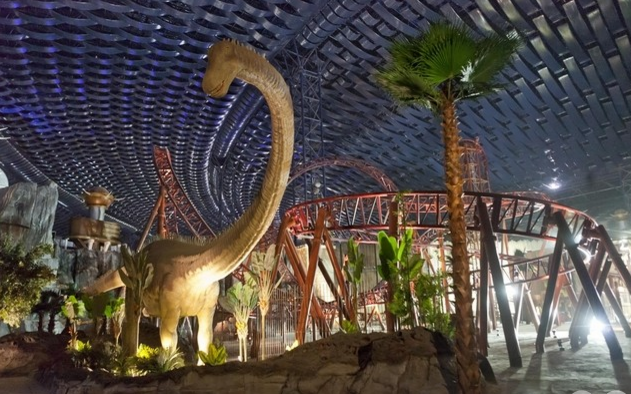 The signature ride at the theme park, the Velociraptor, sets another record in Dubai — fastest and tallest roller coaster in the emirate. The Velociraptor shoots riders out of the gates to over 60 miles per hour in under three seconds. It also features eight stomach-churning loops and corkscrews. And that’s not all — there are 21 other rides and attractions, 28 dining outlets, and 25 retail stores. The park is air-conditioned to attract visitors even during Dubai’s sweltering summers. IMG Worlds of Adventure also features characters under license from Marvel and Cartoon Network, which is owned by CNN’s parent company. Later this year, the even bigger Dubai Parks and Resorts development is set to open just outside the city. That park — built at a cost of more than $3 billion dollars — includes LegoLand, a Bollywood-themed zone, and a water park. The new theme parks are part of Dubai’s plan to boost tourism to the United Arab Emirates amid plunging oil prices in the Gulf. As many as 18 million visitors could visit Dubai’s amusement centers by 2021, according to analysts.